On March 23, 2011, LASP launched a sounding rocket intended to calibrate the Extreme ultraviolet Variability Experiment (EVE) on the NASA Solar Dynamics Observatory (SDO). The rocket carries an almost exact replica of the satellite version SDO EVE instrument, which will help to determine any long-term degradation of the EVE optical system and will enable EVE to obtain the most accurate measurements possible of solar irradiance. 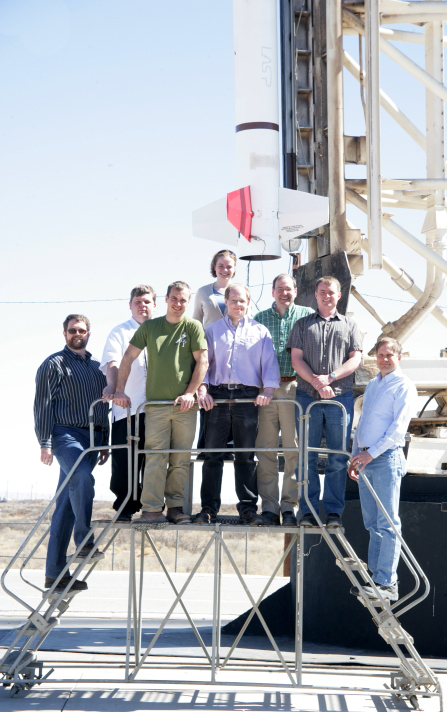 Launched from White Sands Missile Range (WSMR) in New Mexico, NASA Rocket 36.275 provided the second underflight calibration for EVE, which entered into geosynchronous orbit Feb. 11, 2010. Calibration flights for instruments such as EVE occur about once a year. The current measurements are particularly exciting because SDO EVE just celebrated its first year in space and the launch comes soon after a series of large solar storms in mid-February. Being dubbed the “2011 Valentine’s Storm,” the Sun put on a show with more than 50 medium-large flares in less than a week, whereas there were less than 50 such flares during the previous 10 months. The X2.2 flare on Valentine’s Day was the largest flare since the last X-class flare on Dec. 13, 2006. The calibration payload included prototype solar instruments flown for about 20 minutes in space at a peak altitude of 180 miles. After obtaining the necessary solar observation, the payload re-entered the atmosphere, landed via parachute, and was recovered for use on future suborbital flights. For such launches, LASP provides the science instruments and NASA provides all the other subsystems (launch vehicles, telemetry, attitude control, parachute/recovery, etc. ).